It’s only when Kevin muds up the door of the anagama that I get teary-eyed. For all that has passed in front of this stoke hole. For all that we’ve been given. For everything and everyone that has wandered in and out of our lives. For all the prayers that have been stoked along with the wood. For the hopes, the disappointments, the heartbreaks, the unions, the births, the funerals. The moving-ons, the staying-puts. The hellos and good-byes. The escapes. The rescues. The tears, the hurt, the gratitude, the healing. All against the soundtrack of birdsong at dawn, music jams at night, raucous bursts of laughter, low hum of conversation. The crackling of the fire, the roar and whisper of the draft. The first firing of this kiln took place scant hours after planes sent towers crashing to the ground—potters on our first crew had watched a column of smoke rise from the Pentagon. Here in the woods amidst songs of the whippoorwill and the wood thrush, we mourned and healed in turns as we sent smoke of another kind skyward with our prayers. Fourteen years later, the make-up of the kiln crew has changed. Some moved, some simply moved on, always new potters ready to step up to the stoke hole and keep the fire burning. I no longer fear what comes next. It’s just so hard to let them go. Everything’s connected. Everything changes. Pay attention. Old kiln, thank you. New kiln, here we come. Eyes wide open. This entry was tagged aging, anagama, changes, Kevin Crowe, Linda Crowe, Linda L. Crowe, September 11, stoking, Tye River Pottery, wood fired pottery. Bookmark the permalink. I love reading what you so lovingly write. 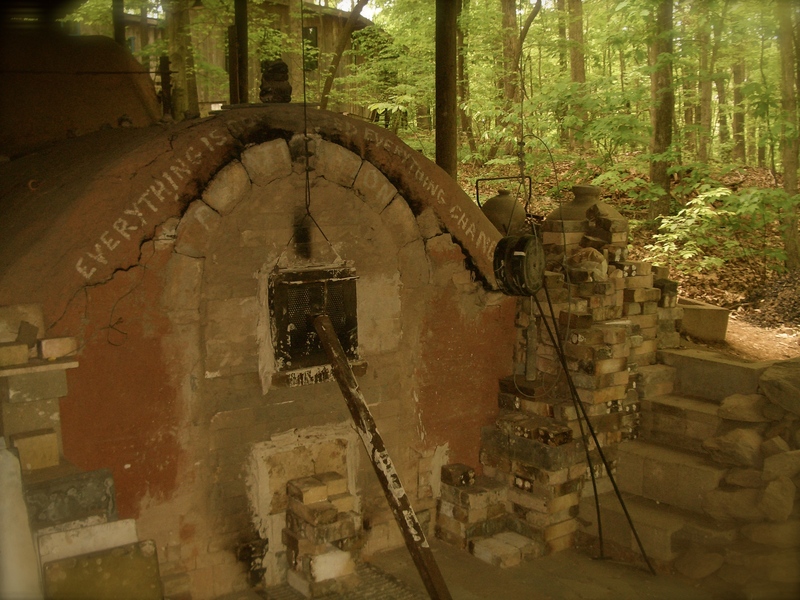 I had no idea this was the last firing of this kiln that has recorded the myriad pots that have been within. For me, never having had a pot inside got to know and love it through the film ‘Out of the Fire’. I have had a screening of that film in my little country town. Some of my townfolk and my students have seen it and just through their short visit with you, Kevin, the crew have become passionate about woodfiring, ‘going slow’….but most of all your family and the family of potters that pass through the doors of your studio, home and lives. Coming from you, that’s a real compliment! Would love to see you two again! Thank you, Judy. We better see you!!! Dearest Linda and Kevin, what mixed feelings. Although I have never been at a firing, my heart is stilled warmed by the hospitality we received during a workshop at your home earlier this year. One thing we know for sure, the only constant is change. Wish I could be there to put down some bricks for the new kiln. Good luck and we’ll meet again.